My time in Brussels is drawing to a close, so I'm on a mission now to maximise what time I have left in this city. Therefore on Saturday, I wanted to visit one of the well-known restaurants on the city's Rue Antoine Dansaert. Saturday had been an extremely frustrating day as it had been raining for the most of the day, and all shops and most restaurants were shut as it was a public holiday. It looks as if consumerism doesn't have quite the same grip on Belgium as it does in Ireland. I think that there would be a revolution in Ireland if all shops and restaurants were closed on a public holiday!! Luckily restaurants were open on Saturday evening, and the rain had stopped. We got into the Kasbah restaurant without reservations after only waiting for a few minutes. While waiting, I picked up one of their cards, which has to be one of the prettiest designs I've ever seen - a lovely metallic red mosaic pattern. 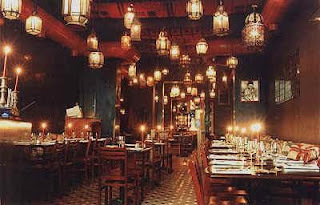 The interior of the restaurant is dim and it is lit by literally hundreds of jewel-coloured hanging lanterns, creating a lovely relaxed atmosphere. I can never relax at a restaurant until I've placed my order, so I focus completely on the menu for the first few minutes. We ordered Harira soup and a Trio de Briwats (deep fried parcels of cheese, chicken and almonds and lastly lamb). Both were quite nice, not spectacular, but the chicken and almond filling in one of the briwat parcels proved very intriguing. I had a lamb tagine with prunes and almons for my main. Those poor waiters. They spend the whole night rushing back and forth from the kitchen with these scalding, volcanic ceramic tagine pots. I wonder if there's ever been a tagine-related accident at the restaurant. Once the waiter had ceremoniously removed the lid, I was able to start shredding the meat from the lamb shank and mixing it into the stew. Our other main was the Kasbah Royal, a plate of tasty mixed grilled meats, served with couscous and a vegetable stew. I got the feeling that the food was peasant-style, though I don't have much experience with Moroccan food. It was tasty, served in generous portions, but I just felt that it lacked a certain flair. For instance, a little touch of honey and tomatoes in my tagine would have elevated it to heavenly propotions. One glass of wine, one Moroccan beer (Casablanca for those beer fanatics out there) and two espressos bought the bill to €60. It was a great value meal given the quantity of food served and the atmosphere was just lovely. Great for a romantic date. I like the best thing about this restaurant is decoration. You can see the snap which is given here. I visited all Saturday to this restaurant. Moreover foods and bears are also marvellous.